Instagram is a great way to express yourself visually. As a lifestyle blogger, I use this creative form of social media to educate my followers on the newest fashion trends, beauty products and lifestyle must-haves. Now, there's a way to shop my latest finds directly from Instagram. 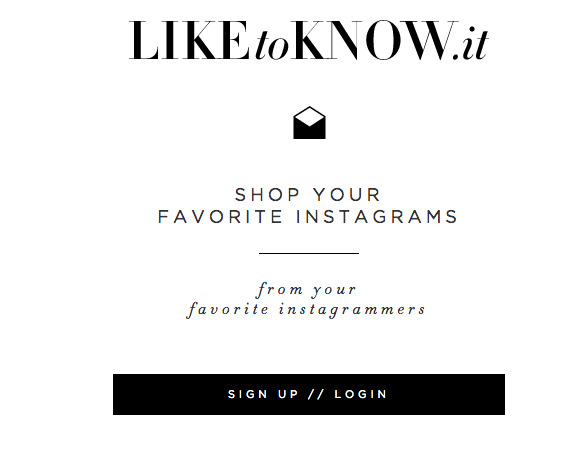 Say hello to LiketoKnow.it, a website where you can shop your favorite Instagrammer's pages. My Instagram feed is filled with varied lifestyle posts that include my favorite items to shop. Just follow these simple steps below to sign up for LiketoKnow.it and you'll be able to shop my curated selection of fashion and beauty picks instantly. 1. Sign up at LiketoKnow.it and enter your e-mail and Instagram information. 2. Go to my Instagram @MelissaMeyers and like the photos with the LiketoKnow.it hashtag underneath (see below). Most of these will be my fashion and beauty posts. 3. An e-mail will be sent to your inbox giving you the links to shop the exact items in that photo (if the items are sold out, there will be similar pieces for you to choose from). I often post great designer deals so check it out! Below are some popular LikeToKnow.it posts from my Instagram feed with recent looks and some great items to shop! Hint: Most of these are on SALE now so you can nab some amazing deals!